Commentary on Guardian website: Student protests: video shows mounted police charging London crowdMet police issue denial but witnesses tell of terrifying ordeal. 24 November: National Walkout against Student Fees and Cuts. In our region, so far there are walkouts being advertised in Leicester, Lincoln and Loughborough and Nottingham. University of Nottingham action confirmed for Wed 24th is as follows: Rally at 2pm on Portland Building steps [view campus map – PDF]. Download Teach-in Leaflet. Then meeting at University of Nottingham, 4PM, ROOM D138 PORTLAND BUILDING, NOTTINGHAM UNI to join students and staff in open discussion. Speakers from University and College Union (UCU), Notts Save Our Services + Many more TBC. Info: 07849392842. 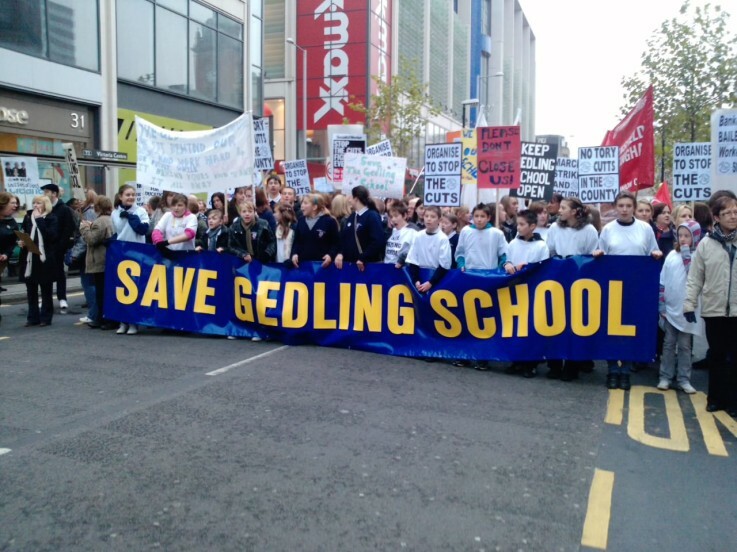 The campaign to save Gedling School and Specialist Science College from possible closure is organising a ‘night of lights’ evening demonstration this week. The event will demonstrate the widespread community support for the school. The campaign began when Nottinghamshire council officers indicated they were minded to recommend the closure of Gedling School, with a decision to be taken by the council’s cabinet members on December 15. Gedling is a popular and friendly school that excels in many areas – in 2009 it achieved the best science results in the whole of Nottinghamshire. Since the possibility of closure has been publicised there has been an upsurge of support for the school across community and party lines. In a meeting on Monday afternoon both Conservative and Labour Gedling District councillors told Nottinghamshire officials that their plans were based on incorrect statistics and muddled thinking. “Any possible withdrawal of our local school, with its specialism and outstanding results in science, and which is at the heart of the local community, would represent a blow to any notion of parental choice. There are no places in neighbouring schools that perform well in the area leaving the only alternative option for Gedling parents a school that is in special measures. Following the huge and lively students’ and education workers’ demonstration on 10th November a National walkout against student fees has been called for Wednesday 24th November 2010. In our region, so far there are walkouts being advertised in Leicester, Lincoln and Loughborough and Nottingham. Watch edited video of protest and direct action ourside Millbank Conservative HQ on 10th November 2010.